Please be sure to measure your dog 2 or 3 times to choose the right size coat  make sure you get the same measurement each time. Your dog should be standing square. You may need 2 people to keep him straight. Use a cloth measuring tape to follow body contours. Follow the Measuring Chart guidelines. If you need assistance, call us at 401-231-7999. We’ll be glad to help. If your dog’s measurements correspond to the Standard Sizes Chart, you can order a standard size coat in any size from XXS to XXLG. Enter the measurements on the Order Form. A = Center front of chest to center of rear cheek. C = Top of shoulder to bottom of chest. 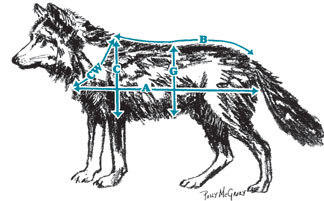 G= Measure girth completely around dog’s stomach. Please Download and print PDF of REGULAR DOG COAT Order Form Here. If your dog’s measurements do not fit our standard coats, please use this chart to take measurements. Please be as accurate as possible when measuring your dog. B = Top of shoulder to base of tail, following contour of back. Please Download and print PDF of CUSTOM DOG COAT Order Form Here. If your dog is a Greyhound, Whippet, Italian Greyhound, Afghan, Saluki, Deerhound or Wolfhound, or other similar breed, please use this chart for measuring your dog. Note the allowance made for these breeds through the deeper chest area and slimmer abdomen. Please be as accurate as possible when measuring your dog. > at start of slope to base of tail. C = Base of neck to bottom of chest. 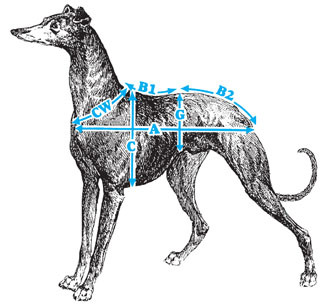 G= Measure girth completely around the dog’s stomach at B1-B2 line. Please Download and print PDF of DEEP-CHESTED COAT Order Form Here.